Facing opposition from private airport operators and after doing a cost-benefit analysis, the government has turned down airlines’ demand for alternative airports in major cities. Airlines had asked the government to open alternative airports, including reopening old airports, citing a shortage of slots and overnight parking bays at major airports. They had suggested using smaller nearby airports as alternatives beyond watch hours. The alternative airports suggested were Agra for Delhi, Aurangabad for Mumbai, HAL Airport for Bengaluru, and Arakkonam for Chennai. “The government pondered over the demand. We did a cost-benefit analysis study and found that most alternative airports suggested by the airlines lacked basic infrastructure for flight operations,” said a senior government official. Airlines had argued opening alternative airports would be beneficial for them because those could be used for overnight parking stands and expanding their networks in the case of slot shortage at metro airports. “There is an acute shortage of slots and parking bays at most airports. We did not get preferred slots at most major airports for the winter schedule. In some airports, it has become difficult to find empty parking bays,” said an executive with a private airline. However, the Airports Authority of India (AAI), which did the cost-benefit analysis, said the cost of refurbishing the airports would outrun the benefits for airlines. “We kept the cost of refurbishing Terminal 2 at Delhi Airport as the base. It was found that building additional infrastructure at the airports would entail a cost of Rs 2.50 crore per month while the savings for the airlines in terms of fuel were coming around Rs 1.80 crore per month,” said a senior AAI official. In the case of HAL and Begumpet Airports, private companies — GMR and GVK, managing the new Bengaluru and Hyderabad airports — have opposed the move. The government shut down Begumpet and HAL airports after new airports became operational in Hyderabad and Bengaluru. Agreements signed with the promoters of the international airports in these two cities restrict the operation of a second airport within 150 km of the two. “GMR and GVK contended the closure of both the old airports is an integral part of the concession agreement. GMR said in Hyderabad it had commissioned an alternative runway by converting the parallel taxiway into a runway, hinting at facility expansion. Following the discussion with all the parties, the government noted the concessional agreement prohibited the operation of commercial flights from Begumpet and HAL Airport,” the official said. A 20 per cent annual growth rate in passenger traffic has led to a capacity crisis at major Indian airports. 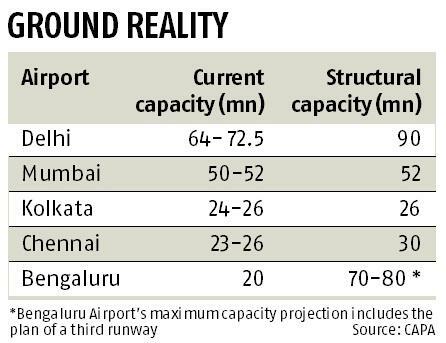 Aviation consultancy CAPA says six major Indian airports will run out of capacity by 2025. “Airlines are burning more fuel due to congestion in the air and on the ground. Network efficiency is being impacted because airlines are forced to operate flights at sub-optimal times and spread their operations to smaller airports because of slot constraints at major airports,” CAPA said. To mitigate the crisis, the Airports Authority of India has planned to invest Rs 36,637 crore in the next 15 years to build airports and upgrade the existing ones.